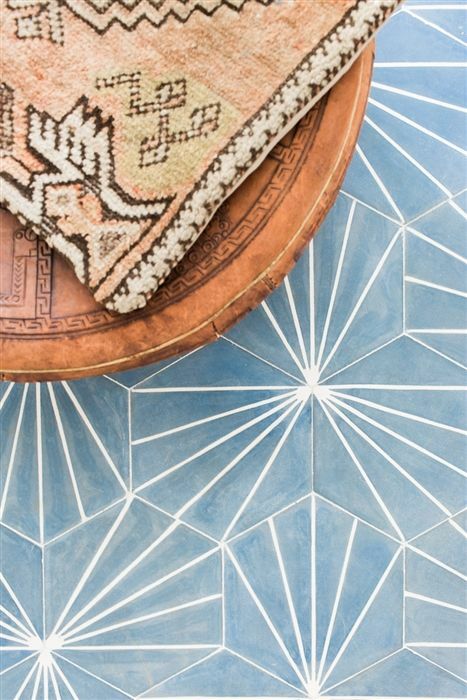 Anyone else loving all the cement tiles in renovations lately? I sure do but I don't see them making their way into our home anytime soon. My friend Sallie just installed some in her home and they look beautiful! (sidetone: you need to be following her current renovation). I wanted to explore a few options to use cement tiles other than the floor or as a permanent fixture in your home! This way you get to enjoy the current trend and lovely tiles while keeping your home all in one piece. This is especially great for renters and those who are a little indecisive (I'm talking to myself here). 1. Serving Tray- I think I am going to try this DIY out for myself. Perfect for entertaining and I've been looking to replace my hexagon tray DIY from a few years ago. Glue tiles to a piece of wood measuring the same dimensions of the wood. Frame in tile with a stained walnut 1x2 piece of wood on each side. Using a strong epoxy, attach drawer pulls to each side. Optional: grout and seal tile to ensure longevity of your tray. 2. 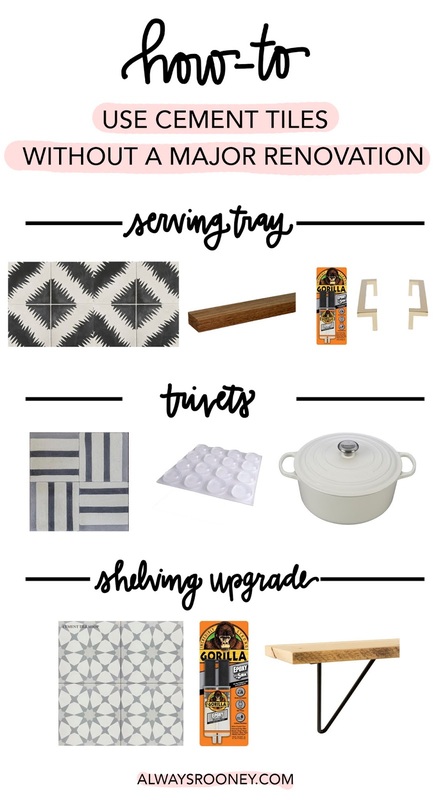 Trivets- the easiest of all the tile DIYs! Grab your favorite tile and attach rubber surface protectors (rubber feet) to the bottom with glue. Some rubber feet are already adhesive so you may be able to skip the last step! Place your favorite dutch oven on top! 3. Shelves- these would look great in the kitchen or bathroom! Take your favorite square tiles, lining them up horizontally. Attach to a piece of thin wood with strong epoxy. Paint the wood to match the tile. After everything dries, attach brackets to the wood and hang! Next time you want to enjoy a trend but don't have a place to add it to your home in a big way, think simpler and see what you can do with minimal materials! This is also a great way to see if you actually like the tile in the long run. A lot of sites offer samples, so try sourcing your tile through a sample since you only need a few for most of these projects. Which one would you make?! *Note: the first image was sourced from Pinterest but I can not find the original source, I would love to give credit - please let me know if you know the source!